We have covered Life Before the Water Sphere – 1951, and now it is time to go way back to life in Union Township, circa 1880, before the Union Flagship, before Springfield’s Playland Park, before the World’s Tallest Water Sphere. 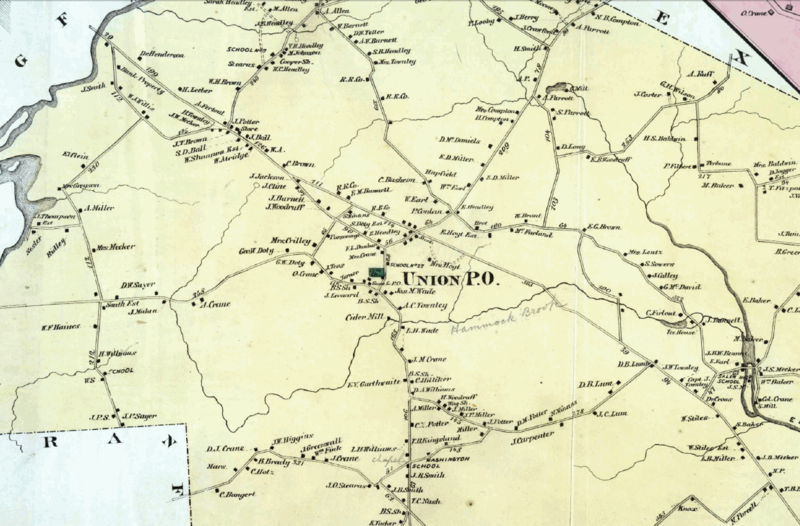 From the map, circa 1880, courtesy of the New Jersey Division of Public Records, you can see many of the same streets and features that exist in Union Township today. The east-west line of Morris Avenue bisects the town. Stuyvesant Avenue and Vauxhall Road stretch out from the center and to the north. Chestnut Street and Salem Road cross at Five Points in the south. Hard to believe, but Route 22 does not exist in 1880. How did they ever purchase their cell phones and flat panel digital TVs back then? Rather, Chestnut Avenue curves westward and merges with what eventually becomes Route 22. A D.W. Sayer lives near the Best Buy near Springfield Avenue. And K.F. Hantes sold his Route 22/Michigan Avenue spread to make way for the McDonald’s. Serendipitously, some of the Union landmarks that exist today link us to the past. The Connecticut Farms Church is clearly marked, as is the Connecticut Farms Elementary School labeled “School No. 27.” The loop of Spruce Street junctions with Liberty Avenue and heads towards Springfield and the Rahway River. Caldwell Avenue shows the old Parsonage. Elmwood Avenue appears to be the home of J. Burnett, a relative of David G. Burnet (first governor of Texas)? In the center of the map is the Union Branch of the Elizabeth River. This is the current home of the World’s Tallest Water Sphere. Curiously, the stream is labeled in pencil “Hammock Brook.” Nearby the current site of the WTWS is a Cider Mill, and downstream lies an Ice House. Follow the Hammock Brook upstream, and you see the it snakes through Kenilworth, under Chestnut Street and back toward Rahway and Morris Avenue, to its source under the current Jaeger Lumber store. This entry was posted on Friday, February 13th, 2009 at 8:38 am	and is filed under Fun Facts, History. You can follow any responses to this entry through the RSS 2.0 feed. Both comments and pings are currently closed.